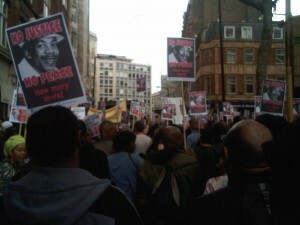 Saturday (16th April 2011) saw the biggest Black-led protest in Britain for twenty years. Thousands took to the streets to demand justice after reggae artist Smiley Culture died during a police raid on his home earlier this year. The police (the only witnesses present) allege that, while the raid was taking place, Smiley went into his kitchen to make a cup of tea, where he stabbed himself in the chest. The weather certainly helped the bright atmosphere of the march, but not as much as the carnival truck, loaded with enormous speakers playing reggae music from the Southbank Club near to where Smiley’s family still live. Families, groups of teenagers and the elderly marched past parliament to New Scotland Yard, with banners demanding justice and sound-system that probably won’t see London again until Nottinghill Carnival. But this protest was not a single-issue campaign about justice for one man. It was a march against the hundreds of deaths in custody which go uninvestigated, and often forgotten. A hugely disproportionate number of these deaths are of Black people, including Sean Riggs, Julian Webster, and Wayne Hamilton. These deaths of course cannot be divorced from the wider effects of an institutionally racist police service, leading to the disproportionate stops, searches, arrests and harsh sentencing which the Black population of Britain have been subject to for decades. But the resistance to this racism spans just as long. 1981 saw thirty urban areas of Britain erupt with popular resistance . Although the ‘riots’ were first racialised in Brixton, with African Caribbean youths resisting police repression by July, class was the main unifying force, with Black and White youths rising up together in Toxteth . Although much of the resistance was relatively spontaneous, one community worker observed: “it is obvious why people went for the police, but there were exact reasons why each of those buildings was hit. The bank for obvious reasons, the Racquets Club because the judges use it, Swainbanks furniture store because people felt he was ripping off the community”. This suggests that this was not just a response to police harrassement, but also to the poverty and unemployment created by Thatcher’s governement. This spirit of resistance is now emerging in both the anti-cuts movement, and the protests against the effects of police racism and illegitimate power. The demands of last weekend’s demonstrators were not particularly radical, and in fact, did not extend far beyond general common sense. They observed that although the UK has more CCTV camera’s per person than anywhere in the world, there are a distinct lack of CCTV cameras monitoring police officers. The back of police vans, and inside prison cells at stations often do not have CCTV, or do not have the tapes replaced, which makes it difficult to prove the cause of death for the hundreds who had died in police custody over the past 20 years. Another demand was for the Independent Police Complaints Commission (IPCC) to become genuinely independent. At the moment, many of its most influential members have close links with the police service, which often leads to collusion, meaning a further investigation outside of the IPCC has to take place in order for the police to be held accountable and for evidence to be properly scrutinised. If a person dies whilst in police custody, the officer(s) present should be suspended immediately until further notice – much like a doctor or nurse would be suspended under similar circumstances of gross malpractice. This will not only serve to remove a suspected murderer from a position of power and influence in the police service, but also add legitimacy to any investigation which claims to take the death of a person in custody seriously. 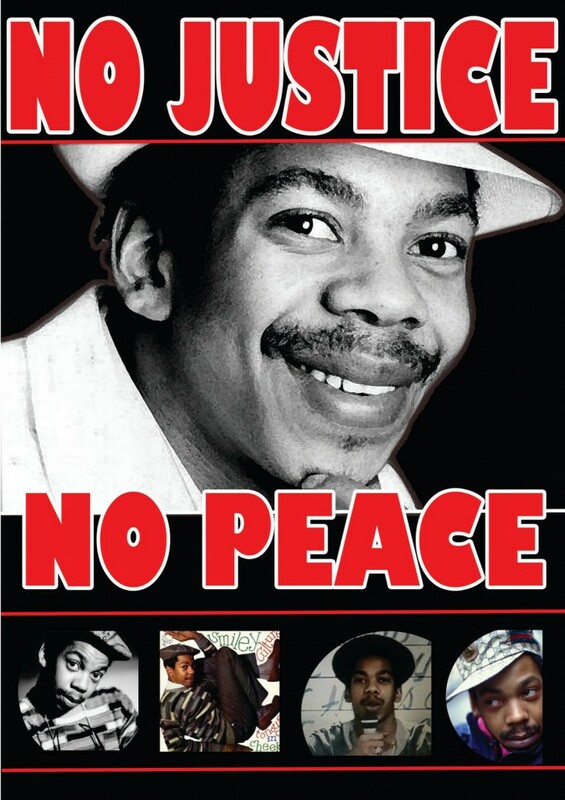 The fight for justice for Smiley Culture and many of the other victims of police racism and brutality continues. Youth events and meetings are already being planned to demand an end to state power being wielded with such devastating effects. Black communities are organising and resisting in a way not seen since they fought Thatcher, and the weakness of the coalition government suggests that progress is not out of reach. Adam Elliott-Cooper, a writer and activist, is Ceasefire Associate Editor. His column on race politics appears every other Sunday. He tweets at @adamec87. « Previous: Politics Black Bloc or White Toffs: who are you calling dangerous? With 90% of Senior investigators, over 60% of deputy senior investigators and over 30% of investigators at the IPCC being ex-police it’s no wonder they are widely regarded as being complicit when investigating their colleagues. The Smiley Culture campaign have hit the right note with their demands, CCTV in the back of police vans, a real police complaint system independent of the police and the immediate suspension of all officers involved with deaths in custody, finally and of clear importance to the campaign a full public enquiry into Smiley’s death. On the CCTV point I would go much further and believe the police have become so distrusted that they should now routinely be fitted with personal video recording devices. Another serious area of concern regarding CCTV is that all police station video is locally controlled, meaning that if wanted they can be interfered with by those in the police station under control. It is high time that the locally controlled video is centrally recorded and controlled, most shops have this technology and indeed the Met police have previously refused such upgrades to their system. In the Sean Rigg (read up on his case if you haven’t heard of it) case CCTV, which the family had been told existed, vanished. The family were then told the CCTV in question hadn’t been working for 3 mths. Tapes that by pure co-incidence would have given clear indication of what had happened to this man. The Smiley march was excellent and since the event I have spoken to many who will be joining me should a second be required. No justice, no peace. The public have had enough of a corrupt bunch of bullies – body cameras are must for all police offices & when the mess up ! Hand them their p45 and see how quick they clean up their act . Mrs May should not give them a penny & put them under pressure to behalf better when dealing with the public .